Rank and Organization: Lieutenant Colonel, 10th New Hampshire Infantry. Place and date: Swifts Creek, VA, 9 May 1864. Date of Issue: 31 Aug 1893. Buried: National Cemetery, Arlington, Va. (Section 2, Lot 936, WS). 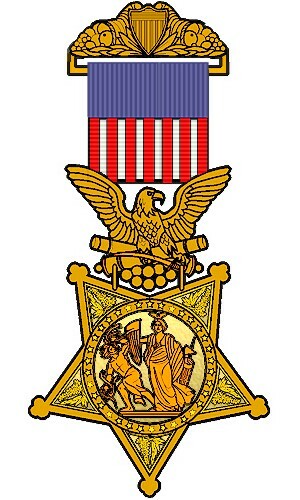 Citation: During a sudden night attack upon Burnham's Brigade, resulting in much confusion, this officer, without waiting for orders, led his regiment forward and interposed a line of battle between the advancing enemy and Hunt's Battery, repulsing the attack and saving the guns. When the 1860 census of Manchester, NH was taken, John Cloughlin was 22 years old, single, and a self-employed grocer, in business with Michael Gillis. John was living with Michael Gillis (age 33), and his wife Johanna Gillis (age 31) and their five children, all born in New Hampshire in 1860. Mr. Coughlin never married. From: New Hampshire in the Great Rebellion by Otis F. R. Waite (page 428): "When in the summer of 1862 three hundred thousand troops were called for by the President, to meet the emergency in which the country was placed by the defeats of the Union army, it was determined by the Governor and Council to raise an Irish regiment in this State and it was designated the Tenth Infantry. Captain Donohoe, who had distinguished himself as an officer in the Third Regiment, was offered the command of the Tenth and signified his willingness to accept the responsible position. He was commissioned Colonel on the 6th of August, 1862, and soon came home and assumed the duties. Colonel Donohoe, Lieut. Colonel Coughlin, also of Manchester, and others who had been commissioned in the Tenth Regiment, addressed meetings of citizens in that city and other places, appealing especially to their fellow countrymen, and very soon secured the requisite number of men -- Manchester furnishing the larger part of six companies. The regiment was fully organized, mustered into the United States service, and left the State for the seat of war in September -- but little more than a month after Colonel Donohoe received his commission. He went with his regiment to the field, and its history, with that of the Third, goes far toward making up Colonel Donohoe's personal military record. In the summer of 1863, and during much of the time afterward, until the close of the war, Colonel Donohoe was in command of his brigade. He was wounded severely on the 29th of September, 1864, when in command of the skirmish line in the assault on Fort Harrison. Early in the day his horse was shot under him. He showed great coolness and bravery until wounded late in the day. He was appointed Brigadier General United States Volunteers, by brevet, for gallant conduct in the field, to date from March 13, 1865. His regiment was among the first to enter the city of Richmond." ….. (page 432): During the months of January and February 1863, the health of the regiment was exceedingly bad, and for a long time there was an average of more than one death per day. On the 5th of February Colonel Donohoe started for home on a leave of absence, and the command of the regiment devolved on Lieut. Colonel Coughlin. ….. (page 440): On the 15th of September, 1864, Colonel Donohoe, after a protracted absence, returned to the regiment, and Lieut. Colonel Coughlin was assigned to the command of the Fifth Maryland Veteran Volunteers, and afterward to a provisional brigade of new troops from Pennsylvania; and was subsequently Provost Marshal of the Department of Virginia and North Carolina, including the Army of the James. In March, 1866, Lt. Colonel John Coughlin of Manchester, NH signed a petition, along with the leading citizens of Manchester, NH with the Governor, the Attorney General and other Civil War leaders to Hon. William H. Seward, Secretary of State. 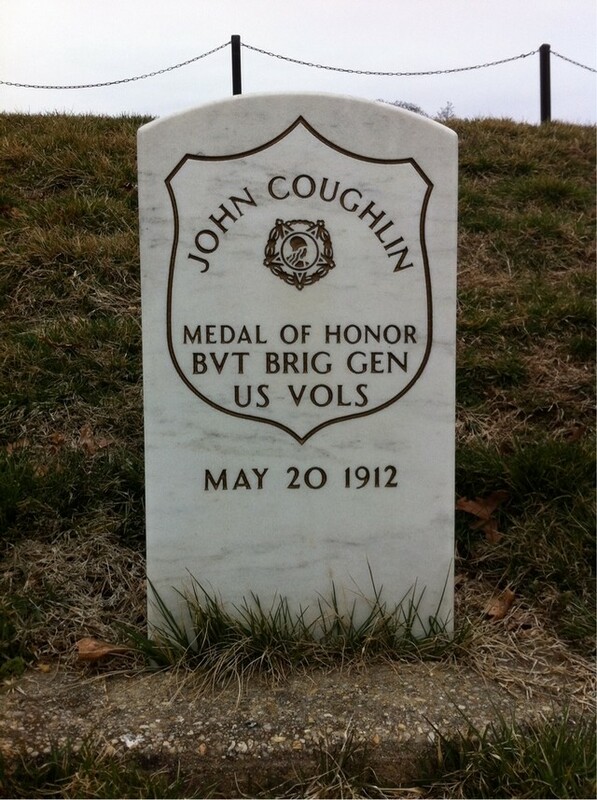 John's brother Jeremiah Coughlin (also born in Vermont) was a Civil War soldier in the 11th Mass. wounded. Jeremiah Coughlin of Boston, Mass. enlisted 13 Aug. 1862 (at the age of 25 yrs) as a private in Co. "A", 11th Massachusetts Infantry. He was a "Seaman" He was mustered out 27 July 1865. Jeremiah Coughlin (b. Montpelier, Vt. age 28), enlisted in the US Army in Boston, 28 Sept. 1865. Sailor by occupation; 5 ft. 11 and ½ inches; died at Brookhaven, Mississippi 2 Sept., 1868. Courtesy of Linda M. Welch, Dartmouth College.